Megan Keller (Farmington Hills, Mich.) set new Women's Hockey East single-season records for most goals and points by a defenseman with a five-point (1g , 4a) weekend. Helping the Eagles to sweep Providence, Keller recorded her 13th goal and 31st point in league play this year, increasing her existing career records for a defenseman in the process. 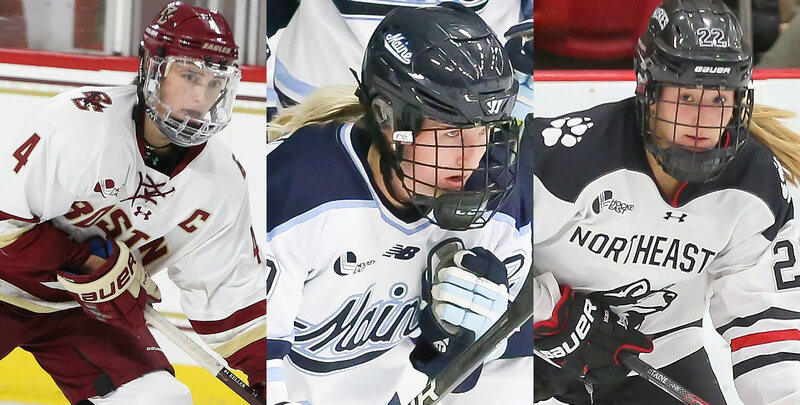 Maine went 1-0-1 in a home stand against UConn thanks in part to a four-point night from freshman Celine Tedenby (Ornskoldsvik, Sweden) in Friday's 5-1 victory. On Saturday, a scoreless draw, Carly Jackson (Amherst, N.S.) stopped all 21 shots she faced while UConn's Morgan Fisher (Vernon, Conn.) kicked out all 33 she saw. Northeastern swept Vermont in a two-game set, coming from behind in a late-game rally to take Friday's contest, 2-1, in overtime before skating away with a 5-1 decision on Saturday. Sophomore defenseman Brooke Hobson (Prince Albert, Sask.) scored the game-winning goal in overtime on Friday and dished out two assists in Saturday's 5-1 victory. It was her second game-winning goal of the year and fifth multi-point effort of the season. Boston University gained three points in the Army ROTC Hockey East Standings with a 1-0-1 mark against Merrimack last weekend. Sammy Davis (Pembroke, Mass.) pumped in four points (2g, 2a) against Merrimack, including the game-tying goal with just 1:03 remaining in regulation in Saturday's 3-3 road draw. Jesse Compher (Northbrook, Ill.) became the first skater in the NCAA this year to 30 assists. Merrimack senior Katelyn Rae (Courtice, Ont.) became the first-ever player in program history to record 100 career points with an assist Friday night against. A goal and an assist in Saturday's tie lifted her with a three point weekend, and she currently sits with 102 career points. New Hampshire swept Holy Cross last weekend to keep pace with Maine in the Army ROTC Hockey East Standings. Jenna Rheault (Deering, N.H.) enjoyed had a career-high day on Saturday as she dished out three assists on three straight goals as the Wildcats defeated the Crusaders 4-1. It was the first time all year a Wildcat had three assists in a game, and the second multi-point game of Rheault's career. Rheault was also tied for a team-high plus-three on the weekend and blocked three shots. 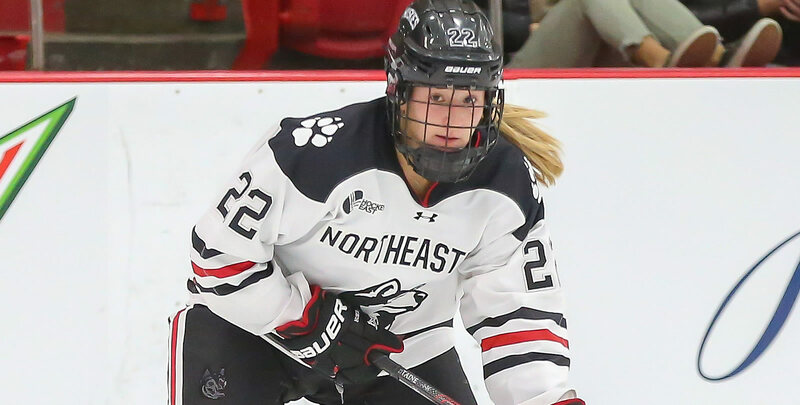 Northeastern will clinch a top-four seed in the Women's Hockey East Tournament with one more point in league play. Additionally, Vermont can clinch a playoff berth with a win and Holy Cross loss this weekend. The two teams square off on Sunday. Megan Keller (Sr., D; Farmington Hills, Mich.) tied for the league lead, and led all blueliners nationally, with five points on one goal and four assists. 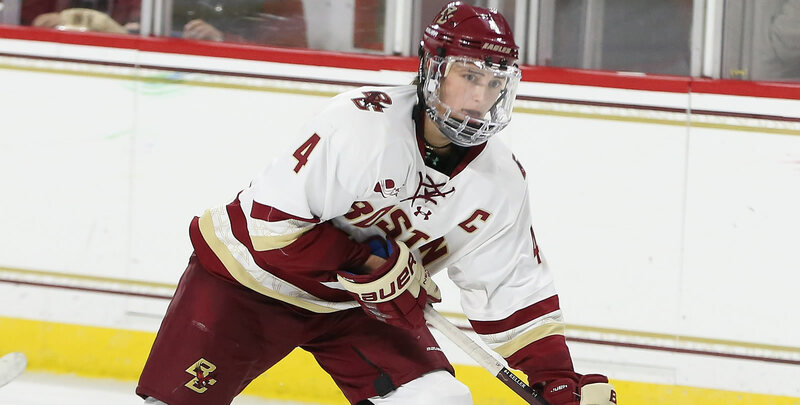 She potted the game-winning goal in BC's win over Providence on Friday to tie the Hockey East single-season goals record for a defenseman (13) and also picked up two assists in that game to set a new single-season Hockey East points record by a defenseman (31). On Saturday, Keller picked up two more assists to finish a conference-best plus-six on the weekend. The senior also had three blocked shots and four shots on goal and now sits tied for 10th in the country in points with 34 on the season. Celine Tedenby (Fr., F; Ornskoldsvik, Sweden) posted a four-point (2g, 2a) game on Friday in a 5-1 victory over UConn, including netting the game-winning goal. 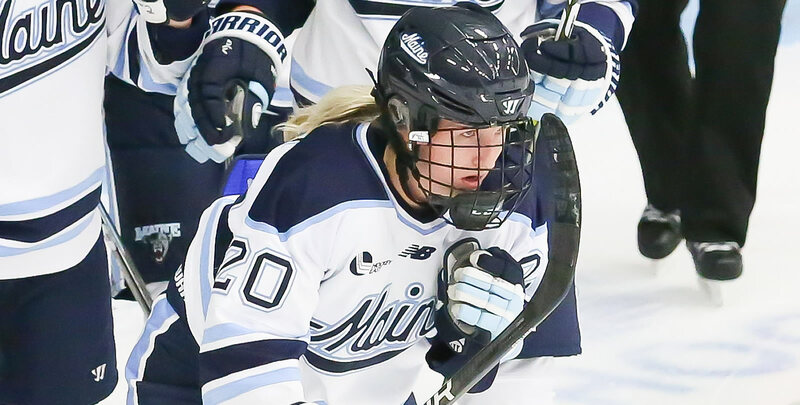 She ended the game with a plus-five rating while her offensive outburst helped the Black Bears to their fifth game this year scoring five or more goals. Skylar Fontaine (East Greenwich, R.I.) netted the game-tying goal with just 3:00 remaining in regulation to help Northeastern come from behind and earn a 2-1 overtime victory over Vermont on Friday. She went on to dish out two assists, including one on the game-winning goal, in Saturday's 5-1 win. She finished a plus-five on the weekend, and now leads all of Women's Hockey East with a plus-29 rating on the season. Maddy McArthur, BC (Fr., G; St. Catherines, Ont.) Took a 2-0-0 record on the weekend against league-rival Providence to move the Eagles to 15-7-0 in league play and keep sole possession of second place in the Army ROTC Hockey East Standings. She stopped 43 of 47 shots she faced and is now tied for second nationally with 17 wins and leads all rookies in that category. Sammy Davis, BU (Jr., F; Pembroke, Mass.) Pumped in four points (2g, 2a) in a 1-0-1 weekend with Merrimack, including the game-tying goal with just 1:03 remaining in regulation in Saturday's 3-3 road draw. She tallied a goal and an assist in each game. Mackenna Parker, BU (Fr., F; Clavet, Sask.) Picked up a career-best three points (2g, 1a) in Friday's 6-3 victory over Merrimack, including a career-high two goals. She wrapped the weekend with a plus-five rating and was not on the ice for any Warriors' goals during the twogame series. Kristina Schuler, BU (So., F; Webster, N.Y.) Lit the lamp three times in two games against Merrimack, including the game-winning goal on Friday. Schuler's two goals in Friday's win were a career high. She scored the Terriers' first goal of the game in both contests over the weekend. Carly Jackson, ME (Jr., G; Amherst, N.S.) Gave up one goal across a pair of key WHEA contests. Jackson's lone goal on Friday came in the third period. Jackson pitched a 21-save shutout, her third of the month, in a 0-0 tie against UConn on Sunday. Katelyn Rae, MC (Sr., F; Courtice, Ont.) Became just the first player in Merrimack College program history to record 100 points with an assist Friday night against #10 Boston University. A goal and an assist in Saturday's tie lifted her with a three point weekend, and she currently sits with 102 career points. Carlee Turner, UNH (Jr., F; Scottsdale, Ariz.) Scored a pair of goals this weekend against Holy Cross, netting a goal in each of two wins against the Crusaders. She tallied the final goal in both games, the first coming late in the third on the power play to give the Wildcats a 4-1 lead. Turner was a plus-one on the weekend and had a .576 faceoff percentage (19-14). Paige Rynne, UNH (Fr., F; Ancaster, Ont.) Recorded two points (1g, 1a) in a weekend sweep of Holy Cross. Jenna Rheault, UNH (Sr., D; Deering, N.H.) Enjoyed had a career-high day on Saturday as she dished out three assists on three straight goals as the Wildcats defeated the Crusaders 4-1. It was the first time all year a Wildcat had three assists in a game, and the second multipoint game of Rheault's career. Rheault was also tied for a team-high plus-three on the weekend and blocked three shots. Brooke Hobson, NU (So., D; Prince Albert, Sask.) Scored the game-winning goal in overtime in Friday's 2-1 win over Vermont and dished out two assists in Saturday's 5-1 victory. It was her second game-winning goal of the year and fifth multi-point effort of the season.